Preet Bharara is not the first to try to strip corrupt New York politicians of their state pensions. State Comptroller Thomas DiNapoli has proposed legislation to do so, as has a group of Democrats in the State Senate. But the state’s constitution protects those public pensions, even for lawmakers “convicted by a jury and jailed by a judge,” in Bharara’s words. So the U.S. Attorney for the Southern District of New York proposed on Monday a new way of recovering the money paid to politicians convicted of corruption: using civil forfeiture to confiscate the pensions of those convicted. Specifically, Bharara’s office is targeting the pensions of four officials involved in the recent mayoral race bribery plot, as well as State Sen. Eric Stevenson, who was arrested in a separate bribery scheme. If convicted, their pensions could be subject to forfeiture. “He said he would use federal forfeiture law to claw back pension interest that accrued while an individual engaged in criminal conduct,” The Wall Street Journal reports. Basically, that means Bharara’s office would treat the pensions as ill-gotten assets, subject to government seizure. Because the pensions are constitutionally protected, any forfeiture action will be subject to approval by a judge, the New York Times notes. 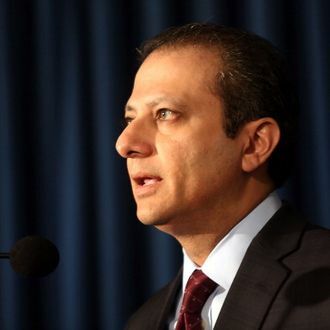 But if it works, Bharara may have found a way to do what the state legislature hasn’t been able to.